If things go according to plan, Hawaiian election clerk and instant Obama denialist celebrity will be on Reality Check Radio 15 minutes from now (March 31, 2010) at 9 PM Eastern Time. Will we finally achieve closure on who claimed that who saw what when? Well the show happened with Tim Adams in the spotlight for about 2 hours. 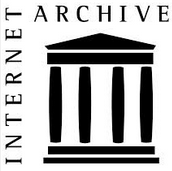 You can use the link above to access the archived show shortly. Yours truly participated for part of the show. Did Tim finally tell us who saw what records? He said specifically that Elections Division staff contacted the Hawaii Department of Health, Kapi’olani and Queens hospitals and were told that they had no records on Obama. So we now know what records he claimed were queried; however, he refuses to name anyone who queried the records, nor did he explain how anyone in the Elections Division legitimately asked about someone who was not registering to vote in Hawaii. The show covered a lot of ground, and I hope folks who didn’t get to hear the show live will check out the archive or the transcript when available and continue the discussion here. The transcript is now available now. All one needs to do is read birther comments on this web site, or on thousands of others, to find misinformation enough to last a lifetime and more. 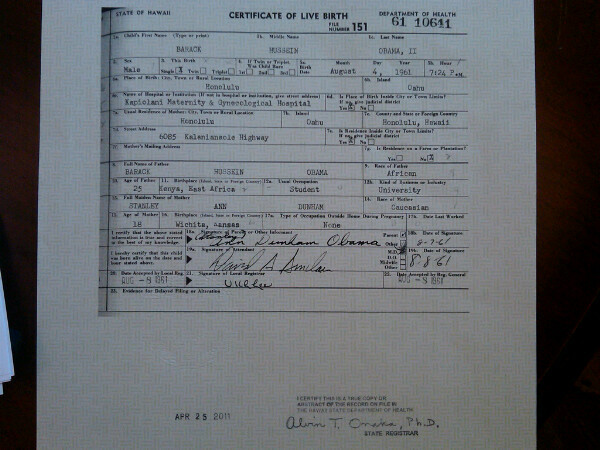 Too many birthers, so little time. 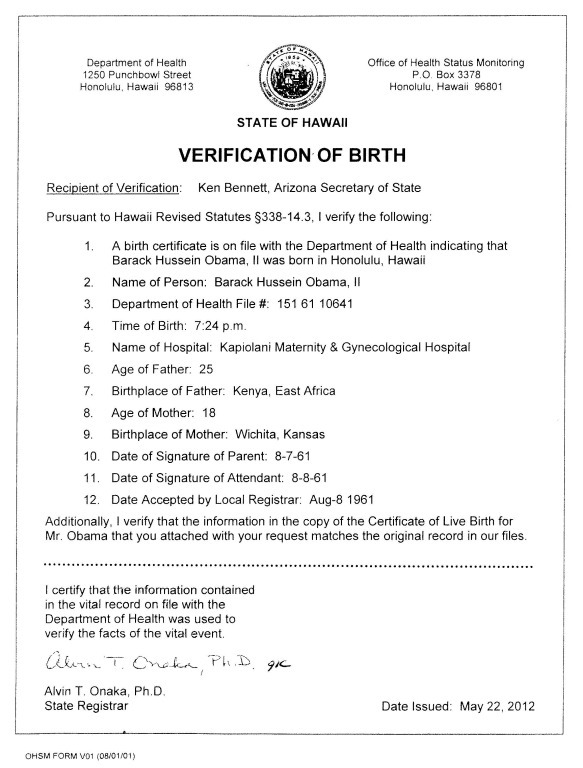 Experts from FactCheck.org authenticated Obama’s birth certificate. Actually some staffers from FactCheck verified that it was a real piece of paper with a raised seal on it, then took some pictures. Presidential hopeful Pawlenty said: “CNN reported, they saw the certificate.” What CNN broadcast was a copy of the Internet image, not the actual certificate. No news organization except FactCheck.org has seen the physical certificate. Pawlenty also mentioned “the advertisement… the hospital announcement.” There was no advertisement; it was a Health Department list in the newspaper. There hasn’t been any hospital announcement. The high-priced talent interviewing Donald Trump let him spout nonsense and never challenged him. If they did their homework and exposed Trump for the clown he is, perhaps we wouldn’t have to suffer his bad hair another week. Case in point: Donald Trump. In an interview with Bill O’Reilly on Fox News last evening, Donald Trump said that two weeks ago he thought that Barack Obama was probably born in the US. “Today” he downgrades that to “possibly.” What has happened? Trump said on an earlier Fox News interview that he had been looking over the Internet for the past couple of weeks. Conclusion: the Internet rots your brain. In his lengthy decision, federal judge David O. Carter dismissed the case as to all the plaintiffs saying, among other things, that they lacked standing to bring the suit and that parts of it were filed in the wrong court. 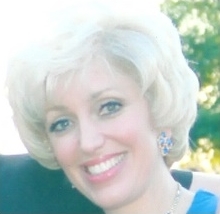 Gary Kreep and two plaintiffs (Drake and Robinson), and Orly Taitz with the balance of the plaintiffs filed separate appeals with the 9th Circuit Court of Appeals, which decided that the two appeals would be heard together. It is possible that the oral arguments will be canceled, as they were in Hollister v Soetoro, and the appeal decided on the briefs. We will just have to wait and see. When is a long form not a long form? Dad: Well if you want to go to Canada, the first thing you will need is a Passport. Son: I don’t have one of those. Dad: And to get a passport you’ll need a birth certificate. Son: I vaguely remember one, but I haven’t seen it in years. Dad: I think I have a copy, but it won’t do you any good. Starting April 1, 2011 your South Carolina birth card won’t be valid for a passport application because it doesn’t have the parents’ names on it. Look at this South Carolina specimen card circa 1977. You see that it has much of the needed information, but not parent’s names. Son: I guess I will have to order a birth certificate and I expect that I can do that on the Internet. Dad: Sure, you can go to VitalChek.com, but they charge a fee that about doubles the price of the certificate. It’s better to order one directly from the State. Then you can use an online form to fill out your passport application. The good news is that starting April 1, 2011, our local post office will be a Passport Acceptance Facility. 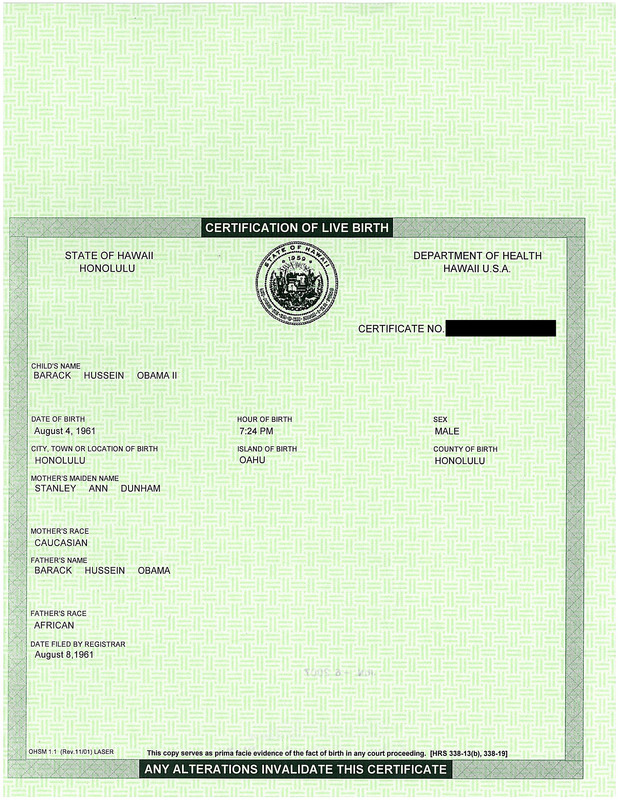 Certified copies of the actual birth certificate that was filed by the attendant at birth will only be issued when a computer-generated form is not available. Sorry Senator Graham, no presidential run for you. 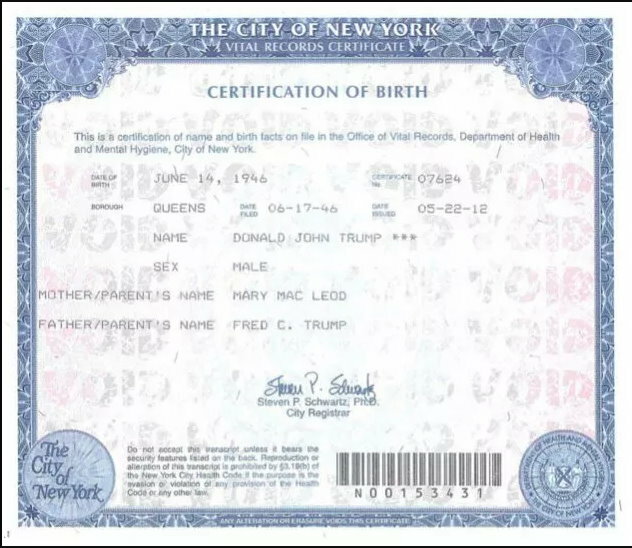 Trump’s birth certificate – VOID! 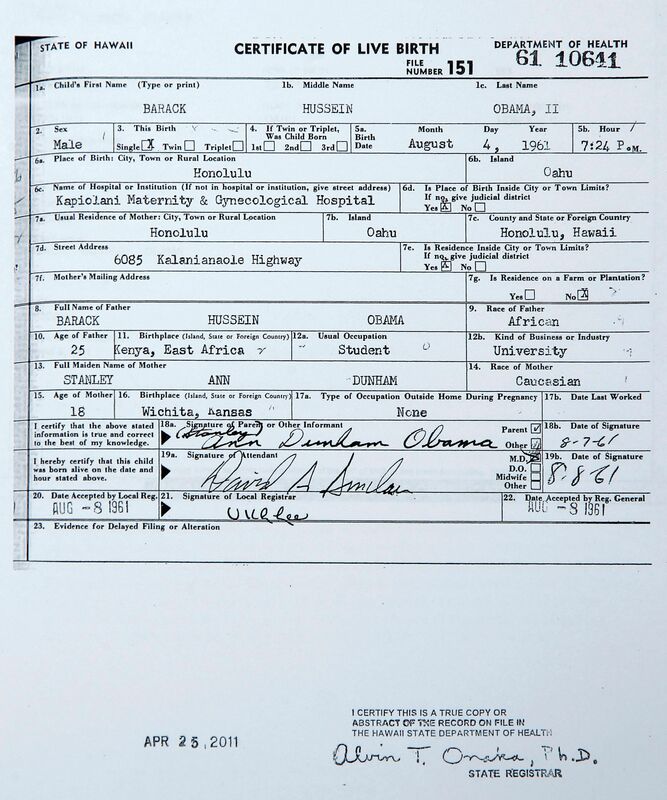 Donald Trump has been going wild questioning President Obama’s birth certificate, but Trump has inadvertently raised a new question about his own birth certificate. Obama Conspiracy Theories expert Polarikist has been examining of the Trump certificates and discovered that Trump’s certificate has been VOIDED. By adjusting light levels, we have determined that the Trump certificate is marked VOID. There is really nothing odd here. The “VOID” image is just there to prevent photocopying the certificate. However, I still fail to see a raised seal anywhere.